The Wakulla Springs Alliance is striving to protect and restore spring flow, water quality and the ecological health of Wakulla Spring and River. The alliance is composed of scientists, and other experts knowledgeable of the local hydrology, land use planning, local government, water use and education. We work collaboratively with other organizations to support federal, state and local government agencies in protecting our local water resources from further decline with emphasis on Wakulla Spring. 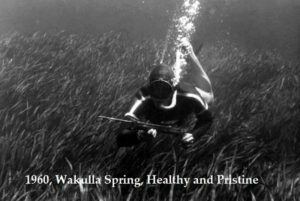 The Wakulla Springs Alliance goal for the ecological restoration of the Wakulla Spring and River is to restore the aquatic flora and fauna and water clarity to its condition at state acquisition in 1986. This includes the same relative abundance and diversity of aquatic plants, fishes, reptiles, and birds inhabiting the spring and river within the state park.